2016 was my best year in real estate and I know it is the same for many of my colleagues. I'm anticipating the real estate market to remain stable in 2017 and don't foresee any increases in sale prices or number of transactions. January has already started off to be very busy with many sellers getting their homes ready to sell this spring. Below is a 3 year market snapshot showing you the median sale price, number of real estate sales and average amount of time to sell of single family homes in the Pioneer Valley, Franklin County area and the hill towns of West County. As you can see the hill towns still take longer to sell but our median price range is higher than Franklin County and entire Pioneer Valley region. There is a drastic increase across the region in the number of homes that sold. As long as the mortgage interest rates continue to be at an all time low giving buyers the ability to borrow more, I don't foresee a slow down in the market. If you have interest in moving and would like to know the value of your home, feel free to give me a call at 413-337-8344 or email wanda@wandamooney.com. 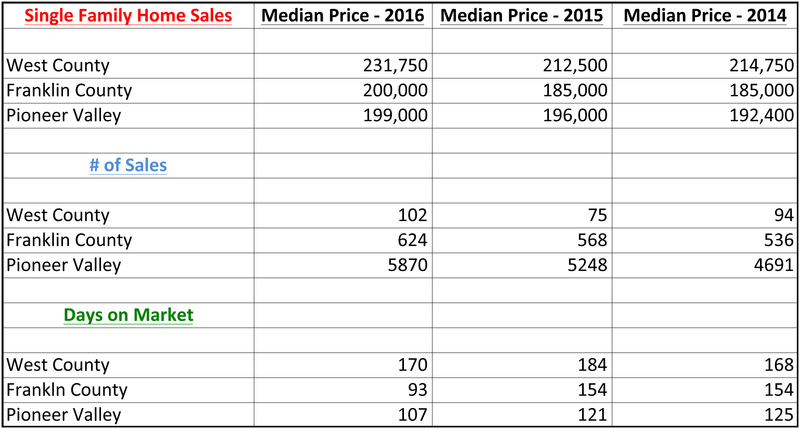 The figures below are taken from the multiple listing service and do not include private sales. West County includes the towns of Ashfield, Buckland, Charlemont, Colrain, Conway, Heath, Hawley, Monroe, Rowe, and Shelburne.